North Korea has repeated its call for the U.S. to agree to declare an end to the Korean War, saying the move would help create a favorable atmosphere for building trust between the two sides. The Rodong Sinmun, the official newspaper of the North's ruling Workers' Party, said on Thursday that declaring an end to the war is "the demand of our time" and will be the "first process" toward the peace and security of the Korean Peninsula and the world. The newspaper added that it is "abnormal" to see distrust and animosity going on between the North and the U.S. even now, saying that it is time for the two nations to take action toward declaring an end to the war. 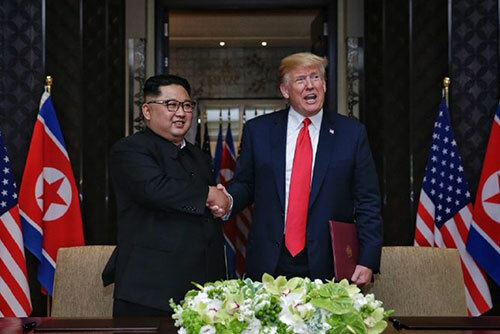 The paper also referred to the joint agreement reached in the June summit between North Korean leader Kim Jong-un and U.S. President Donald Trump, in which they agreed to work together to establish a lasting and solid peace regime.